Accident at The School Furnishing Co.
about the place, whom the police, with Supt. Rogers and Inspectors Goodman and Dobson at their head, experienced great difficulty in keeping back. TONS OF BRICK FELL ON THE PEOPLE BELOW. and taken into a row of cottage homes which were opposite and close to the works, and doctors at once sent for. The two men who were killed were layed on the ground, and covered with canvas. On the person of one of them was found a card bearing the name “Hogg” and showing that he belonged to the North Road Weslyan Church. The identity of the other did not long remain in doubt. He was recognised as Thomas Boddy, living in Albion Buildings, Northgate, a married man and employed by Mr Richard Mosely, tanner. No medical men had put in appearance when one of the victims succumbed to the frightful injuries he had sustained. He was a shoemaker named Thompson, living in Jane Street, Rise Carr. Kindly, if inexperienced, hands tried all they knew to assuage the sufferings of the survivors until the arrival of the doctors. First and foremost amongst these good Samaritans was the Rev. E Lloyd Jones, who was on the scene at the time of the catastrophe and who was at first reported to be injured. The Rev. D Bailey was also to the fore with his good services. Four hapless victims lay in Mrs Burney’s house, five in Messrs M`Lachlan’s office next door, three more in Mrs Dromgolo’s on the other side, and at Mrs Pinder’s three more. In another cottage (Mrs Davison’s) lay five other unfortunate victims. A number of persons who had been struck by falling bricks at once hurried away home and two of the boys who had been taken into Mrs Pinder’s were able to be conveyed home, neither of them seriously hurt. About eleven o’clock Dr Fraser arrived on the scene, and not long afterwards he was followed by Dr Lewis Eastwood, then by Dr Hill-Drury, Dr Manson and Dr Ironside. In M`Lachlan’s office lay a youth with a compound fracture of the skull – a very bad case; another boy was suffering from internal injuries; one man lay with a compound fracture of the left leg and a second with a compound fracture of the skull and fracture of the ankle. In Mrs Davison’s home there were three cases of broken legs. Apparently one of the most grave cases was that of a boy – lying in Mrs Burney’s cottage. He had received shocking injury to the head, the brain protruding on to his forehead. A few minutes after 11 o’clock ambulance stretchers had been procured , and the work of removing the dead and the carrying of the surviving injured to the hospital was proceeded with. But before the whole of the sufferers could be taken away, one more death was reported. A girl named Isabella Gamble, living at 10 Killinghall Street who was almost the last to be brought out from underneath the debris had sustained a fractured leg and was removed to her home. About ten minutes to twelve the last portion of the roof of the building devoted to the drying of timber fell in with a crash. The police renewed their efforts in keeping back the crowd, who seemed, not withstanding the disaster that had befallen other sightseers, as if they could not get near enough the burning buildings. A strong wind was blowing at this time, fanning the flames, and rendering the efforts of the firemen of little avail. At 12.15 the flames had got a firm hold of the bottom storey of the building, and when the windows and door were burnt out the fire was seen to be raging with great fury. Fortunately about this time the wind died down, but the fire having obtained a great hold on all of the wood inside the building the flames held uncontrolled sway. The efforts of the firemen were chiefly directed to the saving of the engine house, the only portion of the whole pile of buildings remaining apparently intact. At one o’clock another of the walls showed signs of falling from the great heat, the continuous streams of water having little appreciable effect. Looked at from the railway or north side of the premises, where an extensive uninterrupted view was obtainable, the scene presented was one of impressive magnificence. With amazing rapidity the flames spread through the centre and the east wing. Soon the whole became one glowing mass. The firemen were perforce unable to bestow any attention to this side, and the heat became so intense that it was uncomfortable to stand within 40 yards of the raging element. After the roof had disappeared the floors, which appeared to be fireproof, sustained great heaps of the burning material. Belching flames poured from the windows greedily licked the walls. But there still was no sign of any attempt to cope with the fiery enemy on this side. A quarter past eleven was timed by the still moving clock in the boiler house before the N E R fire engine from the North Road works put in an appearance. After a little delay had ensued the pumps were got to work, and a steady but short stream was poured into the now slackening fire. Attention was chiefly concentrated on the strong fireproof boiler and paint house. On two sides the flames burnt fiercely, and it looked as if it were impossible to prevent them spreading to the more dangerous portion. But a constant stream poured on for some time decreased the intensity and minimised the danger, and attention was now enabled to be transferred to a stock of wood – in the yard. Slight flames observed issuing thence were speedily subdued. Meanwhile the furnace like appearance of the fire in two upper storeys had disappeared. Gradually the partitions disappeared, and the bottom of the building received the whole burning debris. The stored wood burnt furiously and rapidly, and quickly spent its force, and amid the crashing of walls and showering of golden sparks the fire became gradually manageable to the ready helpers. 1 Robert Wilson, workman in the moulding shops of the School Furnishing Company, residing at Leadenhall Street, Darlington. Suffering from fracture of the skull. Conscious; and states that he suddenly found himself fall, covered with bricks and mortar. Since unconscious. 2 Thomas Stanton, of 61 Nestfield Street, Albert Hill, worked at the Alliance Works. Remembers being at the left hand corner of the building and standing on the outside edge of a vast crowd, not far from where the firemen were at work, when the wall fell, as it appeared to him, on his head, and a great weight pressed on his back and legs. The doctors report leg broken in two places and injuries to the back. 3 John Sullivan, of 40 Prestcott Street, Albert Hill, thirty years of age, employed at Darlington Steelworks. Scalp wound and contusions. 4 William Butler, twenty one years of age, lives at 65 Lucknow Street, and worked at the Wheel and Axle Works, Bridge Yard. Severe scalp wound. 5 Charles Spencer, of 63 Bondgate, workman at Snaith’s Joinery, Four Riggs, sixteen years of age. Contusions of the head. 6 Jonathan Wilson of No 10 Albion Street, fifty-eight years of age. Been out of work. Fracture of leg. 7 Lionel Stainsby aged 18, worked at Pease’s’ Successors? Factory, Priestgate. Fracture of skull and broken leg. (The operation of trepanning? Was performed in this case). 8 James Birdnall? Of Oxford Street, a boy of twelve. Fracture of skull and dislocation of ankle. 9 James Haw aged 15, resided at 11 Catherine Street, North Road. Worked at Barninghams steelworks. Was unconscious when admitted but afterwards identified by his father. 10 Thomas Sowerby of Lowe Street, about 25? Years of age, workman at the Steelworks; says he heard someone calling out “The wall’s falling!” and knew nothing more until he found himself being attended to by the nurse in the Hospital. Scalp wound and contusions. 11 Samuel Ford, aged 22, also a workman at the Steelworks. Reside in John Street. Says “ something fell on us and flattened us all to the earth”. Leg fractured. 12 William Boston aged 34 years, has been some time out of work, resides in Post House Wynd. Injury to hip and scalp wound. 14 Ralph Smith aged 27, a married man residing at No 60 Brunswick Street. Fracture of skull. 15 John Henry Blenkinsop of No 1 Parkgate, 26 years of age, seaman. Fractured arm. 16 George Beaumont, unconscious – no address obtained. Fractured skull and compound fracture of leg. At a quarter to three o’clock Robert Wilson, the first named in list of injured, died. One of the spectators was Corporal Brownrigg of the 9th Lancers, who did yeoman service in helping to assist the victims from the debris and afterwards to alleviate their sufferings. Mr John Spence, the well known member of the Salvation Army, also rendered splendid assistance. What the damage is to the building and its contents cannot be estimated with anything like accuracy. The building was erected 13 years ago by the North of England School Furnishing Company, specially for the purposes of their business. Have come to light. One was that of Mr John Prior, son of Mrs Prior, Dolphin Hotel. He was watching the fire from the east corner of the west gable when he heard a noise overhead, and simultaneously a cry of warning. Instinctively he crouched close to the wall, with the result that, whereas he saw dead and dying all around him, he escaped with an injured head, caused by a falling brick, a bruise on the forehead – his hat having broken the force of another missile – and a contused shoulder. His hat was knocked off and lost, and a walking stick was struck from his hand. Standing beside him was his collie dog, who came out of the ordeal scatheless. Mr Prior states that he saw quite a number of persons, bleeding from the head, face and hands, who made their way from the ill fated scene without delay. The Lady Superintendent and the hospital medical staff desire to publicly express their ? of appreciation of the great trouble and kindliness of heart shown by those men who carried the injured to the institution on Monday night.” They were a set of brave fellows”, declared the Lady Superintendent, with ardour. The value of ambulance knowledge emerged, members of the police force and the working classes were admirably exemplified in the interval of painful suspense which elapsed before the doctors came on to the scene of the catastrophe and excellent service was rendered by Inspector Goodman and some of his men and by a number of civilians , one of whom, a St John’s Ambulance man, named Garood?, living in Surtees Street, the doctor’s say, displayed unusual skill in applying bandages and splinters. His Worship the Mayor ? in our advertising columns, a meeting to be held this afternoon for the purpose of organising a public subscription for the benefit of the widows and orphans whose bread winners have been taken away under such appalling circumstances. Mr Robert Hall, traveller, 5 High North terrace, is suffering from a compound fracture of the skull. A serious case. A son of Anthony Moses, Catherine Street; compound fracture of the skull, is convulsious throughout the night. Miss Martland, Brunswick Street, contusion of the scalp, and shoulder bruises. Two other cases of a less serious nature. Patient of Dr Johnson, Assistant of Dr Dern? Fred. Barnett, Sun Street, a boy ten years old; nasty scalp wound. A boy named Saint, living in Park Street; scalp wound; in delirium all night. Annie Walton (a girl), 20, Albion Street; bruised hips. William Thompson (a boy), 20, John Street; concussion of the spine and severe bruises on the head. Albert Barnett (16), Sun Street; fracture of the thigh just above the knee and scalp wound. Severe shock to the system. Isabella Gamble (15) Killinghall Street; complicated case. Severe injury to the spine, attended with excessive pain; severe sprain of the ankle; scalp wounds, four or five of them down to the bone; shoulder injury, and other minor injuries. A boy living at 20 Chapel Street; a number of scalp wounds and injury to the back..
A man named John Montague, 54, of Nestfield Street, severe contusions on the back, near the shoulders; great pain; shock to the system. Another man named Robinson, 19, Henry Street; two scalp wounds and injuries to the thigh and arm. Severe shock; prostate condition. All the medical gentleman who were engaged at the hospital appear to have been summonsed at their private residences to attend to outside patients, sufferers from the accident; and, of course, were unable to respond to these further calls of duty. Throughout the night, and during the whole of yesterday, the material in the shell of the destroyed works continued to blaze, albeit water was poured onto it uninterruptedly. Hundreds of people visited the place, but were kept under strict control by the police lest they approached too near the shaky, bulging, windowless and roofless walls. All that seems to remain intact is a fireproof building at the north west end of the works. This was used as a drying shed, engine rooms, boiler house and workshop. The timber yard at the east end of the works is also untouched by the conflagration. The total damage is estimated at between £6,000 and £7.000, which, we are informed by the directors, is not wholly covered by insurance. The building and contents were insured with the Liverpool, London and Globe Company, whose district manager, Mr R A Wood, Newcastle, looked over the ruin yesterday preparatory to making a report. The origin of the fire remains a profound mystery. Heat was supplied to the whole works by steam pipes, so that one obvious danger was thoroughly guarded against. The fire, whatever its origin, had reached its height with remarkable suddenness , for just before the outbreak was discovered the watchman had been his rounds and had observed nothing unusual. The fall of the fatal gable – deepening as it did a grave disaster into a tragic calamity that has thrilled the whole North of England – will no doubt receive searching investigation at the inquest. The testimony of eye witnesses, as usual on such occasions, varies as to the manner in which the disaster occurred. The general opinion is that the wing of the building from which the gable fell was not on fire till some fifteen minutes after that event, and that the gable was really blown out by an explosion of gas or turpentine or steam rising in dense volumes from the water thrown on the flames by the hosepipes of the firemen and pent in the upper storey. All are agreed that simultaneously with the disaster there was heard a loud report – quite distinct from the noise of the falling bricks, and apparently produced by explosions. One theory may be dismissed as untenable, from the fact, which we are able to state on authority, that no turpentine was stored in the portion of the works at which the disaster occurred. Mr Theodore Fry, member for the Borough of Darlington, yesterday wired from Tower House, Bristol, expressing his deep sympathy with the sufferers by the terrible disaster at the North of England School Furnishing Company’s Works reported in the Northern Echo of yesterday, and regretting his absence from home at such a moment. The Coroners inquiry into the facts and circumstances attending the deplorable deaths of Thomas Boddy, Robert Francis Thompson, Thomas Hogg and George Wilson, the victims of the fire disaster in Darlington, was opened yesterday morning at the Railway Tavern, Northgate, at 10.15 before Mr Deputy Coroner J T Proud. An upstairs room of the hotel was used for the melancholy purpose, the comfort of the jurymen being provided for by the host, Mr Charles Johnson, who had had the apartment well warmed. John Wharton, Robert Airey, Samuel Wilson Berry, James Henry Davey, Henry Blair, Edward Stokes, John Hawkins, Henry Clayton, John Guthrie, Alfred Denham, and Benjamin Payne. Ex-Councillor John Wharton was elected the foreman of the jury. The Coroner (addressing the jury): The first thing we have to do, gentlemen, is to view the three bodies which lie on the premises here; the I think we might see the place where the accident happened, and then go to the hospital mortuary , where lies the fourth body, and the all assemble here again. The bodies of Thompson, Hogg and Boddy lay in an outhouse, situated in a singularly spacious stable yard, which is attached to the hotel. Some difficulty being experienced in opening the outhouse door, the right key apparently having been mislaid, the jury determined to first inspect the scene of the calamity. 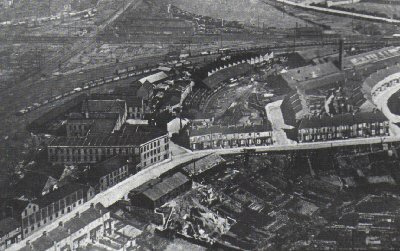 The wreck of the burnt out works of the North of England School Furnishing Company is not far distant from the Railway Tavern, and the jury, satisfied with a cursory inspection of the fateful gable, part of which blew out onto the unfortunate people below, were soon on their way to the hospital. The jury were absent three quarters of an hour. They then proceeded to what had been described above as an outhouse, but which, on the door being opened, proved to be a stable containing a number of stalls. Each of the bodies, covered with a clean, white cloth, was laid on a bench in a stall. The appearance of the deceased was in marked favourable contrast to the ghastly spectacle they presented immediately after the catastrophe. The Mayor (Councillor Harding), Mr W C Parker and Mr George Marshall – the two latter being directors of the School Furnishing Company – were present at the inquest. Mary Heughff?, who is occasionally engaged at the hospital, and ? lives in Bells Place. She said : About half past one o’clock on Tuesday morning I was called up. I saw the deceased George Wilson, at the hospital. He was suffering from scalp wounds and a fractured skull. I was present when he died at a quarter to three, apparently from the effects of the injuries. He was never conscious after I saw him. I called Dr Simpson in after death took place. Three doctors had previously seen the deceased. Robert Wilson, son of the deceased George Wilson, living in Leadenhall Street, said : My father was 64 years of age, and was a fitter. I was not present at the accident. I had not seen him since the accident until this morning. – By Inspector Dobson : My father was employed at the North of England School Furnishing Co’s Works to do the fitting work. – By the Coroner : He was not employed in the building which was burnt down, but in an adjoining premises. Charles Boddy, labourer, living at No. 4 Temperance Place, said : - The deceased, Thomas Boddy, was my brother. He was twenty eight years of age and employed as a fellmonger. He lived in Law’s Yard, Northgate. I was not present at the accident, nor did I see him until the next morning. Inspector Dobson replying to the Foreman said the deceased was one of the two who were killed instantaneously. Robert Frankland, locomotive fireman, living at No. ? Teetotal Terrace, Albert Hill, said : The deceased Thompson was a brother in law of mine. He was thirty one years of age and was a shoemaker. I knew nothing of the accident. I was on the scene an hour and a half after it occurred. Inspector Dobson: He died a few minutes after the accident. Thomas Howness?, joiner, living at 58? Skinnergate, said : The deceased, Thomas Hogg, was my brother in law. He was 36? years of age and a blacksmith. I did not see him until the morning following the accident. This concluded the evidence of identification. The manager of the works was next called. He said : My name is James Stabler and I am manager of the North of England School Furnishing Company Work’s at Darlington. They have no works elsewhere. My attention was first called to something wrong at the works at a quarter to ten o’clock on Monday night. I was there all the afternoon until half past 4 o’clock, when all was in order. At a quarter to ten a boy came down to inform me that the works were on fire. I immediately went up and found that the watchman, with the assistance of other few men, had fixed our fire hose to the hydrant outside the building. There is a staircase leading from the lower floor into the joiner’s shop, which is in the middle portion of the works, and it was this part that was on fire when I got there. They were playing on the fire through the window. They had very little presence of water. At least the hose was doing no service. At that time the Fire Brigade from the town arrived, and they suggested that we should uncouple our apparatus and they would ? to it. When they had done so it was no more effectual than our own. The Coroner : They also found the pressure insufficient, I suppose? – Yes. What did they do? Give it us? shortly, because it really does not matter very much. – Well, they played upon it with the water they had until we applied for the North Eastern fire engine, and then we cut the fire off from part of the building. Did you cut that part where the gable end fell? – No, the other end. We saw there was no possibility of saving the part that fell, so they at once played upon the fire to cut off that part which fell, and the drying house, and engine house, which are now standing. Had a large crowd gathered ? – Yes. They were standing close up to the gable, and right across the street. I did not see the wall come? Out. I was on the railway, so as to get the fire engine to play between the two buildings. Then you don’t know what happened until you came back again? – I did not know what happened until I saw them laid dead. What did you find when you came back?- I found two men lying dead opposite where the accident had happened. You found the gable had fallen in to the street? – Yes. Mr Parker (one of the directors of the company ) : How much of the gable? – Witness: It was made level by the eaves. The Coroner: From that part above the spout I suppose? – Yes. And it had fallen onto the crowd? – Yes. Mr Parker : At this point may I ask whether there was any inflammable material in that part of the building – an unturned off gas pipe or anything but merely wood and iron and such like? – Witness : I am told that the watchman turned off the gas before he began to put out the fire. There was nothing inflammable in that part of the building any more than the timber. The Coroner : Was there, say, explosive kept there? – No explosives at all. Can you account for the gable coming out as it did? – Well, I cannot account for it at all. The only opinion I have upon it is that the smoke was so dense that when I went upstairs into the middle room I could not bear it for more than a second, and the firemen had to lie down and reach the pipes in through the wall. I quite think that the explosion was the gases that had accumulated from the fire, and the water being played into those gases had caused them to expand and blow the end out. There was very little escape for the smoke at the other end of the wing. The ventilators were closed. The smoke rose up the staircase and filled the upper room before the men reached it. It appeared that as soon as the water commenced to play on that part of the building the accident occurred. I did not see any fire in that part of the building where the explosion occurred. I would have considered standing under the gable where the accident occurred perfectly safe at the time. When I got round after the gable fell I saw two men lying, but did not know either of them. They had been taken out of the debris and placed against the side of the houses opposite. The other injured people had all been removed. By a juryman : I was there when the building was built. The two bottom storeys of the gable were fifteen inches thick, and the third storey nine inches. It might be considered remarkable that the gable should be blown out sooner than the slates although it was very strong being boarded all the way up. I have not the least idea how the fire originated. There is not a fire about the place with the exception of the boiler house, which was saved. The premises were heated by steam. The fire originated 50 feet from any machine. It originated in the joiner’s shop which is lit by gas, which is turned off at the meter at 5.30? every night. The meter is situated 30? Feet from where the fire originated. There were no men working overtime in the joiner’s shop. Mr Parker : having obtained leave from the Coroner to question the witness as to the precautions taken against fire asked if all the shavings and sawdust were not cleared away every day? Witness : Yes. That night the men left work at 4 o’clock. The boys had been engaged in clearing away all the shavings and sawdust till five o’clock. It was taken into the engine house so as to be ready for the engine man the next morning. The floors were as clean as any parlour. When the men cease work the watchman of course goes round. There was danger of a fire if a machine was running till the last minute by the barings becoming heated and the watchman went round to detect this at 5.30pm. You can detect it better when all is quiet than when the machines are running. The watchman takes his rounds again between eight and half past to see if anything is wrong. That night, I am informed by him, he went round at a quarter to nine. There are two hydrants fixed in the street – one at each end. We only have one standpipe and one hosepipe. We are fully fitted up. The Coroner: You appear to be, for you got it up immediately. We have fifty buckets placed in different parts of the building. In one place, which we consider more dangerous, we have fifteen buckets placed, and in others nine and eight and so on. Mr Parker said he thought it would be satisfactory for the jury to hear that, because they were ? in an inflammatory kind of trade. The Coroner: Had you plenty of water? Witness: We had not. The pressure was insufficient. What is the size of your pipe? I was informed by a member of the Council that there was a six inch pipe to the end of the street and a four inch pipe in the small street up to the building. By a juryman: The ages of the lads engaged in cleaning the place out range from fourteen to seventeen. The foreman is left with them to look after them. There is a notice in the works prohibiting smoking. The Coroner: What about the use of matches in the place? Witness: We have an electric lighter; but I have found matches in the place. I think it is a rule apparently for all men to smoke now, and it is very hard to keep it down. James Thompson said: I ? as watchman at the School furnishing Company’s works, and have charge of the engines. The joiners left the place at 4pm on Monday, the boys at 5 with the foreman, and the clerks at 5.30. I was three times in the building after that. As soon as the clerks came away I turned the gas off at the meter, in the extreme west end of the building. At 5.30 I looked round and all was perfectly right. I was round again at seven o’clock. I looked at the machinery. Nothing was overheated; in fact there was nothing at all to point to or suggest anything wrong. I carried an oil lamp. At 8 o’clock and again at 8.45, I was over the building when there was no trace whatever of fire. It was my ? to look over the place as often as frequently as this. About twenty minutes to ten o’clock – I had just gone to bed – when a young woman called me up and said she doubted the place was on fire. I went at once and saw that the joiners shop was on fire. By Mr Blair (juryman); It seemed to me that the two first benches were blazing. By the foreman: I had past that part at a quarter to nine o’clock. It was the very last place I left and had to pass the benches in order to get from the room. The Coroner: Did you see the gable fall? Yes. I was coming out from the works with an armful of books from the office. As it came away I was knocked down by the crowd. Did you see any indication of fire when the gable fell? Not the least ? a volume of black smoke followed. But had ? the fire reached that end at all so far as you could see? It had not. It was all in darkness. How long afterwards did you see the flames? I should not like to say when the flames did come out. You still saw no flames? Replying to Mr Stokes (juryman): the manager interrupted, and said that below where the fire broke out was a store of spirit and varnish and the flames ? reached the roof by means of a staircase. Witness (continued): When I got out the works’ hosepipe and fixed it I found an insufficient supply of water. I have every confidence that if I had had a good supply I should have quenched the fire there and then. By the foreman: I tried the hosepipe last evening. The water then ? the height of the spout; it would not go over the building. The pressure is not always the same, and on Monday night it was very deficient. The manager: The supply varied very much during the fire. At one time it went right over the roof and at others you could scarcely see it coming? at all. Witness: We seemed to get a heavier pressure as the night advanced. The foreman said the pressure after eight o’clock was supposed to be as strong then as at anytime, and he had no doubt that after the people at the waterworks were aware of the fire they would get the two engines to work and get a greater pressure. Still, he could not see why the water did not reach the top of the building at ten o’clock. The coroner: It all depends on whether the pipe is sufficient. The manager: The Captain of the fire brigade came to me and he said “ I have two hose pipes now fixed and you see I am utterly powerless for want of pressure”. The coroner: Yes, the pressure seems to have been defective unfortunately, although I don’t see what we can do in that matter. Inspector Dobson was the next witness. He said: I reached the scene oft the fire about ten minutes before ten o’clock. The fire had not at that time got very much hold. The last witness was playing upon the fire through the window. The flames spread very rapidly, and had got a good hold of the building at the time the fire brigade arrived. The coroner: Can you estimate how many people there would be there? I should say there would be at least from 3,000 to 4,000 people. They were along the street, in the fields and on the railway. There would be from 200 to 300 people standing in the shadow of the gable. The police were stationed all round inside the circle to keep the people back.. But you were not keeping them from the gable? No: we allowed them up to the gable end, and kept them from the centre where the firemen were at work. Did you consider standing under the gable safe? Yes, at that time. There was apparently no fire there. That part of the building was in darkness. There was no fire visible in the end where the gable fell? Mr Stokes (juryman): Had you a strong body of police there? Coroner: you saw the wall fall? Yes It opened out at the top, and fell in a mass, only a few partitions of it separating as it was within 8 or 10ft of the ground. Mr Parker: Did you see or hear anything? Yes, many people seemed to observe the wall fall and they cried out. A rush was then made. A juryman: There would be a report? I did not hear a report. The juryman: There must have been a report, or the people would not have heard it coming. The coroner: Had the glass given way at all in the gable? No; the glass in the west wing was still intact at that time. It remained all right until the fire reached that part of the building. I assisted in removing the dead and the wounded immediately the gable fell. I first came across Thomas Hogg, who lived a few seconds. Blood was rushing from the top of his head, where he appeared to be dreadfully injured. We carried him out to the other side of the road, and he died almost immediately. The next I saw was Thomas Boddy; he was injured on the head too. Most of the injured were hurt about the head. Boddy was dead when taken out. I did not see the other men. About half an hour afterwards Thompson, who was then lying dead in one of the cottages. He was injured about the lower part of the body.. Boddy presented a shocking sight. His head was injured and his bowels protruded. I did not see flames in that particular part of the building for three quarters of an hour afterwards. I was looking at the gable when it fell but did not notice the black smoke belch out. There was no one in that part of the building. I may say that we have received every assistance from Mr Stabler, the manager, in this matter. We always find a difficulty in keeping the people back at times like that, and when the fire bell rings a great concourse of people gathers up. The bell was rung to call the firemen? I believe it is the custom to call the firemen between 6 am and 10 pm in that way; but believe between 10 pm and 6 am they are called by telephone, which I think is very much better. Some of the houses are connected by telephone and the others are warned by call boys. A juryman; The men are not supposed to be at home during the day. Witness; There is no doubt the fire bell is the most expedious way of getting the firemen together. Mr Stabler said he would like to say, on behalf of the force, that he and all those who assisted in putting the fire out were greatly impressed with the excellent order that was maintained. The people were kept at a reasonable distance, and no inconvenience was experienced in getting to the hoses. The Coroner said there was no doubt the police did their duty very efficiently. Supt. ? James Edward Smetton? gave corroborating evidence. Mr Airey said he was watching the fire from his bedroom window, about a quarter of a mile distant, when he saw a streak of light run along the outside of the slates to the gable, which then fell. He heard the noise of the explosion and the cries of the people. Mr Blair said he saw a dense volume of smoke emerge from the gable, but did not hear the report. This was the whole of the evidence. The Coroner summed up very briefly. He said the evidence clearly showed that in this lamentable case these men met their deaths accidentally. If the jury were satisfied that the wall fell as the witnesses had described, and that the deceased were killed by its so falling, they could do nothing else but return a verdict of accidental death. It did not appear to him that anyone had been to blame. It was not very clear what was the cause of the wall falling, but he thought it was clear enough that no man was to blame. Therefore, they had no option but to return a verdict of accidental death in all four cases. Proper precautions seem to have been taken by the company’s servants, and he did not see what recommendation the jury could make. The foreman said one recommendation should be made to the company to see that they had a better supply of water for putting out fire. Mr Parker thought it had better be a recommendation from the jury to the Corporation to give the company a better supply. Mr Blair (juryman) endorsed the views of the Foreman respecting the water supply. Replying to the Coroner, Mr Parker said the directors intended to make a representation on the subject to the Corporation. The Coroner said, in that case, the matter would best be left with the company, whose claim for consideration at the hands of the Corporation would be strengthened by the unanimous feeling of the jury. Mr Stokes said after what had taken place he thought he town should have a mortuary in a central position. It did not seem decent for respectable people to have to be placed in a stable. They should have a proper building in a town like Darlington and he suggested that the jury should make a recommendation to the Corporation to that effect. Mr Davey said he must confess that it was exceedingly painful to him to see the bodies lying in a stable, and if the recommendations were noted upon it would be a benefit to the town. The Coroner said he understood that there was no mortuary in Darlington except at the hospital. Inspector Dobson said they had often experienced a great need for one. Sometimes bodies were found and were not recognised, and there was some difficulty in getting a place to put them in. In fact, there was nowhere but a public house stable to deposit them, and it was certainly a very painful thing to put bodies there. Mr Stokes suggested that the mortuary might be built somewhere near the police station. Inspector Dobson said St Cuthbert’s churchyard had been suggested as a convenient site. The Coroner said it appeared to be a very reasonable recommendation and if the jury were unanimous on the point he would be very glad to send it to the Corporation, by whom he had no doubt it would receive proper attention. He would see that the recommendation was forwarded. On the suggestion of Inspector Dobson, it was also decided to ask that an ambulance litter might be placed at the police station. The jury found a verdict of “ Accidental death” and the Coroner drew up a recommendation, to be addressed to the town council, on the subject of a public mortuary and the provision of ambulance appliances at the Police Station. We regret to have to state that another of the injured in the hospital has succumbed. It is the youth Lionel Stainsby, who, after admission to the institution, was subjected to the operation of trepanning. His case was well nigh hopeless from the start, the medical staff believing it was only a question of time. The unfortunate youth died about a quarter to nine o’clock last night. George Carter, who underwent amputation of the leg, lies in a very critical condition. The other patients are all doing comparatively well. Additional to the list already published of the injured who are being treated at their homes are the following who are under the care of Dr Fraser:- Robert Joseph Robson (21) living in Moss Yard Bondgate, cut an eyebrow, severe sprains of legs and ankles, George Lancaster (23? ), Hird Street, Parkgate, severe injury to thigh, Mrs Burr 16 John street, injuries to shoulders, arms and body. Three of the five victims of the fire disaster in Darlington were buried yesterday. They were Thomas Hogg and Thomas Boddy, the unfortunate men who were killed outright, and Robert Francis Thompson, who died very shortly after being brought out from the debris of the fallen gable. Boddy was interred at the West Cemetery, and the others at the North Road Cemetery. In the case of Hogg, the cortege left the residence of the deceased, 4 Ann’s Terrace, Hopetown about half past three o’clock, the body of Thompson being removed a few minutes earlier from the house of his parents in Whessoe Lane. The deceased Thomas Hogg was the superintendent of the Harrowgate Hill Wesleyan Sunday School, and a trustee of the Haughton Wesleyan Chapel. It was upon his body that the Revd. Lloyd Jones found a card which first gave a clue to his identification, and which showed his connection with the North Road Wesleyan Circuit. The North Road Wesleyan’s are at present holding a series of special services, in one of which Mr Hogg took part on Monday night previously to going to the disastrous fire. He leaves a widow, a son and daughter, and an aged father who was virtually dependent on him. Sympathetic groups stood in the streets as the mournful procession passed slowly on its way. It was headed by Sunday school children , and following the hearse came a mourning coach and five cabs, and then a large number of residents in the north end of the town walked in a body. Several thousand people were in the cemetery awaiting the arrival of the funerals. Mr Joseph Gray, town missionary, read the customary service both in the chapel and at the grave side, he being attended by Mr J Hollingrake, home missionary. The sight of the sobbing old father, stricken with a grief that was not to be consoled, was most touching and made an affecting impression upon all who looked upon the sad scene. The ordinary service at the graveside having been concluded; Mr Gray asked those assembled to sing “ Shall we gather at the river?” which he said was a favourite hymn of the deceased. The familiar and beautiful air seemed to have a sul…? Effect upon the tottering, sorrowing father at the edge of the open grave; he sobbed less violently, and as he listened to the singing of the hymn, in a half dazed way, it was evident that memories of a not unpleasant nature were recalled to the old man’s mind, at least if his tear stained, wrinkled face afforded any indication of the passing thoughts within. The hymn being done, Mr Gray said special services were being held every evening this week and next at Harrowgate Hill. At one of these on Monday night, their deceased brother expressed his belief that God’s richest blessing would attend the efforts that were being put forth; and if they would like to meet their brother in Heaven, and join those loved ones who had gone before “ on the shining rivers shore” let them attend these services in a humble, penitent spirit and they would have salvation. At the service on Monday night he, (Mr Gray) wound up by saying that it was in such an hour as we thought not that the Son of Man came; and in an hour afterwards their brother had received the summons, and had joined the Saviour’s ranks of glory. Let me take warning and prepare to meet our God, for Jesus’ sake. The sorrowing relatives then past a last look into the grave, and the aged father, roused from a short reverie, fell again into a paroxysm of crying and lamentation as he was gently led away. We witnessed the falling of the fatal gable onto the people beneath, we saw the dead and dying taken out of the debris, we heard the moans and groans of the mutilated and we were inexpressibly shocked; but we have to confess that the sight of this old man’s grief, as he stood by the grave of a dearly loved son who had been so cruelly and suddenly taken away in the height of his Christian usefulness, affected us more deeply than any incident at that scene, awful as it was. The cortege, which accompanied the remains of Robert Francis Thompson, entered the cemetery immediately after the Hogg funeral procession, and comprised a large number of relatives and friends. Deceased was a single man and his calling was that of a shoemaker. He was buried according to the rites of the Church of England, in the consecrated portion of the cemetery, the Revd E Hutchinson reading the service. The deceased Thomas Boddy was removed from his home in Law’s Yard, Northgate, about three o’clock. Some half dozen cabs, containing the young widow and relatives, and a goodly number of friends, marching in procession formed the cortege. A large crowd had gathered in Northgate. At the cemetery, the coffin was met by the Rev. W Gore-Browne, vicar of St Hilda’s and his ? the Rev. – Robinson, and these Rev gentlemen read the service. – The funeral of George Wilson, another of the victims, takes place this afternoon. Most of the injured at the hospital are progressing satisfactorily. The only exception is the boy James Haw, who sustained dreadful injury to the head. He lies in a very critical state. The man George Carter is reported to have taken a turn for the better. Following the accident the works were rebuilt - Durham Record Office has copies of plans reference number Da/NG 2/1511 - Notice and plan of workshop and offices to be built on the north side of Kinross Street, Darlington, for The North of England School Furnishing Company Ltd. Plan A - ground plan, cellar plan, second floor plan, first floor plan and site plan. Plan B - cross sections (plan no. 1889/14), 5 March 1889. Scale 8 feet to 1 inch; 40 feet to 1 inch (site plan). Another fire happened at the School Furnishing Company on 11th October 1947, by a spark in the paint shop igniting. The blaze burnt for about four hours, with fire crews coming from Middlesbrough and Stockton to help. Nearly £100,000 worth of damage was caused. The insurance bill would have been bigger had the crowd not moved neatly stacked timber out of the path of flames. The factory, in Kinross Street, finally closed in 1981.